Bread baking never has to be dull. Using wild rice puts it on the wild side. Making a bread with low salt content that is still tasty is a challenge, but one that sounded intersting to me, too. A friend had requested this when I offered to make her some bread. I decided to go with my whole wheat sourdough starter, but it would taste good if you used some Rapid Rise yeast and water for the first part, too. Wild rice cooked with no salt in the water was bound to give some good flavor. I added a piece of lemon peel, including lots of the pith, to the cooking water to impart some bitterness and the essential oil of the lemon. To punch up the flavor of the bread I decided to carmelize half an onion in a little olive oil. I added that just before shaping the dough into loaves. 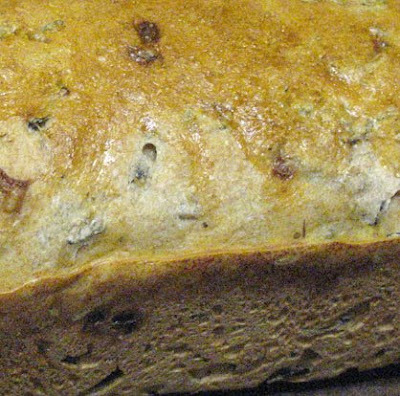 This makes a great bread to go with soup or a stew and it makes wonderful sandwiches, too. When still warm from the oven it is delicious with just a touch of butter spread on the slice. We ate nearly half the loaf that way! You can cook the rice the day before and drain it, but you can also cook it a while before making the dough, letting the rice cool and drain. Doesn't it look wild with the batter? I used the drained liquid mixed with the milk for part of the dough liquid...more flavor added to the bread that way. you could also use buttermilk instead of the milk/lemon combination. As with all my sourdough recipes, if you don’t have sourdough starter, just substitute ½ cup warm water in which you soak 1 packet Rapid Rise yeast for 10 minutes. When it gets foamy, add another ½ cup water and use it where the starter is called for. 1 cup cooked wild rice, cooled and drained – cook in unsalted water with a large piece of lemon peel, including the pith, in the water. Save the drained liquid. 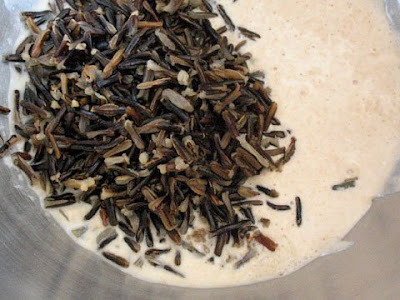 In a large mixer bowl combine the wild rice, sourdough starter, maple syrup. Add the lemon juice to the milk and stir. Let sit 5 minutes. Stir into the wild rice mixture. Mix together 1 cup of the whole wheat flour and 1 cup of the all-purpose flour. Add to the wild rice mixture and stir to combine thoroughly. Let sit uncovered for 1 hour in a warm, draft free place. Cook the the onion in the olive oil over medium low heat, stirring often, until lightly browned (caramelized). Set aside to cool. Mix together the remaining flours. Put the dough hook on the mixer and engage the bowl with the dough. Add the flour mixture to the dough a little at a time until the dough climbs the hook and cleans the side of the bowl. Let the mixer knead the dough this way for 5 minutes. If using dough hook, turn out onto a lightly floured surface and knead more flour into the dough, for about 3 minutes, until dough is satiny and only a little sticky. Shape into a ball. Oil a large bowl and add the dough ball, Turn to coat the ball with the oil. Cover with plastic wrap or damp linen towel and let sit in a draft free warm place until doubled in bulk, about 1 ½ hours. Punch dough down and turn out onto a clean surface. Knead for a few turns to force out air. Spread the dough out into a rectangle about 9 by 10 inches. Scatter about 1/3 of the onion onto the rectangle. Roll up jelly roll fashion and turn the ends in. Turn over and again press into a rectangle. Spread with another 1/3 of the onion mixture. Roll up jelly roll fashion and turn the ends in. Repeat with the last of the onions. (This distributes the onions throughout the dough...the final distribution is made by the kneading. )Begin kneading and knead a few minutes until the onion is evenly distributed. Divide the dough in half. Shape each half into a loaf and put into a greased loaf pan. Cover pans with plastic wrap of damp linen towel and set in warm, draft free place to rise for about 45 minutes to an hour, until dough has doubled in bulk. Lightly brush each loaf with the egg wash.
Place in a preheated 350 degree oven and bake for about 40 – 45 minutes or until top is golden and bread sounds hollow when tapped on the bottom after turning out of the pan. I'm sending this over to that bread bakers's wonderland, Yeastspotting on Susan's Wild Yeast blog. Elle, this is nothing short of stunning. Really a fantastic experiment. I'm in awe. I'm with you about the sourdough and caramelized onions. Not so sure about the wild rice though, but maybe that's just me. Tanita, The yeast is wild, too, but the wild rice really makes this bread! Tanna, Thank you. That means alot. A & N, I think the rice played a big part in keeping the open texture. Andreas, This is nothing like your mother's risotto. I used straight wild rice (a small and expensive package, but it cooks up to a big pot of rice. Since you are only using water, lemon peel and rice, you really get to taste the unique wild rice flavor. I think you might like it! 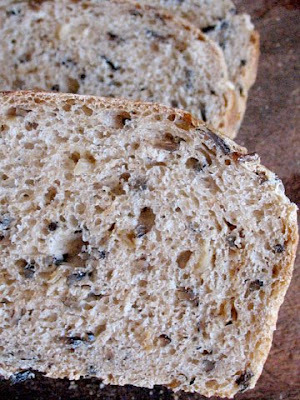 I love the idea of wild rice with your whole wheat sourdough starter. I'm so glad you have gotten your starter groove going so well. The bread just flows from over here Elle! 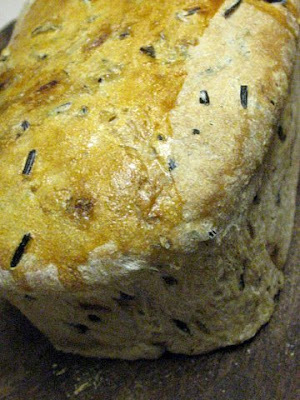 Ooh wild rice in bread -- great idea! I bet its nuttiness would complement the dough quite nicely. Wild rice + wild yeast, well! The Idea to ad wild rice to the bread is a stunning idea. I think, that it would be great for a barbecue. YUM! Being from Minnesota, I've always thought about adding some wild rice to one of my breads. And with a little caramelized onion, this recipe sounds too good!